At Courthouse Clinics we appreciate that every patient is different. This is why our thorough consultations include an exclusive skin assessment programme, developed by Dr Patrick Bowler, to reveal the most suitable treatments and products for you – the individual. Each assessment is carried out by our knowledgeable and experienced skincare specialists so you can receive the best possible advice regarding your skin health. Our assessment programme involves the use of skin analysis technology, such as UV Scanner Imaging technology, which allows our specialists to evaluate your skin and provide informative details on ageing, sun damage, oily areas, skin tone, skin sensitivity and hydration levels. So if you’re looking for treatments or home care products to help improve your skin health, don’t hesitate to book a comprehensive skin assessment today. 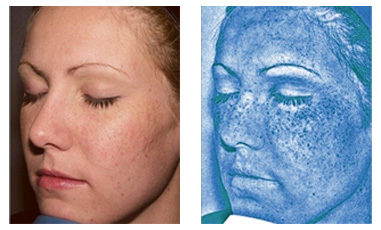 UV Skin Scanner Image Technology can show us the real condition of your skin, we can then inform you of potential problem areas and the best way to look after your skin. I am very happy with my treatment at Courthouse Clinics. I had my skin assessment 18 months ago and and was then prescribed the Priori® skin care range. I’ve noticed a big difference over time, which has had a knock-on effect with my confidence. I was amazed at the bad condition of my skin, I always thought I had good skin until I was put under the UV skin scanner! The therapist talked through all aspects of the treatment and explained which areas of my face needed extra attention. Great examination technique.